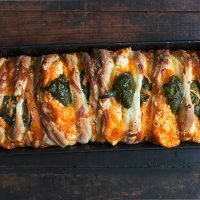 All the great flavours of jalapeno poppers, in yeast bread, pull apart form! Not a bread baker? You can make this with store-bought frozen bread or roll dough, as well! For the bread dough: Combine the milk, butter, sugar, and salt in a glass bowl or measuring cup. Heat in the microwave for 1 - 1 1/2 minutes or in a saucepan until the butter melts. Let the mixture cool to lukewarm. Place the milk mixture to a large mixing bowl or the bowl of a stand mixer fitted with the kneading hook. Add the eggs, yeast, 4 cups of the flour and the potato flour/flakes, if using. Mix to form a shaggy dough. Knead the dough (by hand, with a stand mixer or alternately in your bread machine set on the dough cycle) until it's smooth, adding a bit more flour if needed. Place the dough in a greased bowl, cover with plastic wrap and let it rise for about 90 minutes - to 2 hours, until it's puffy though not necessarily doubled in bulk. *Note that this dough is very slow rising. It won't seem very vigorous and will not really double as usual. Prepare the jalapeno popper filling: Combine the cream cheese and 1 1/2 cups of the grated cheddar cheese in a medium bowl. Stir to combine. Season with a pinch of salt and some freshly ground pepper. Set aside. Prepare the jalapenos: Prepare jalapeno peppers by cutting in half lengthwise, making sure to cut to one side of the stem, so that the stem is intact on one half and there is no stem on the other half. Use a spoon to scoop out the seeds and pulp. Place jalapeno halves cut side down on a baking sheet. Roast in preheated oven for 15 minutes. Remove and allow to cool on baking sheet. Grease a 4x12-inch loaf pan or two 8x4-inch loaf pans. Sprinkle a bit of panko in the pans and swirl around to coat the bottom and sides. Rolling and Shaping: After the dough has risen, remove it to a lightly floured work surface and gently deflate the dough. Roll the dough into an 11 x 16-inch oval, about 1/4" thick. Cut 3 3/4-inch circles with a cutter, jar lid, glass or English muffin ring. You should have 10 circles. You can discard the remaining dough. Scatter 1/4 cup of shredded cheddar cheese over our dough circles. Take a cooled, roasted jalapeno and place it on top of the dough circle, with the pointed bottom of the jalapeno at the 6 o-clock position and the top hanging over the top at the 12 o-clock position. Take a couple tablespoon scoop of your cream cheese filling and place in the top half of the circle. Fold the bottom half of the circle over the top half, pinching it together at the top on either side of the protruding jalapeno top. Place in your prepared loaf pan(s). Repeat with the remaining dough pieces. *Note: If using two 8x4 pans, place 5 dough packets in each pan. I alternated my dough pieces between one with stem and one without. When your pan(s) are filled, sprinkle remaining 1/4 of shredded cheddar overtop and sprinkle with a bit of panko and some freshly ground black pepper. Cover the pan(s) with greased plastic wrap and let the dough rise for about 90 minutes, until it's puffy and starting to fill the pan. Uncover the loaves, and bake them for 25 to 30 minutes for 8x4 loaves or 35-40 minutes for 4x12 loaf, or until deep golden. If your bread seems to be browning too quickly, you can loosely cover with a sheet of aluminum foil. Remove the bread from the oven and allow to sit in pan about 5 minutes. Run knife around edges, then remove bread to a cooling rack. This bread is great warm from the oven or you can re-heat gently by wrapping completely in foil and popping into a 350F oven for 8-10 minutes.